I first visited The City at I12 Katong about half a year ago. 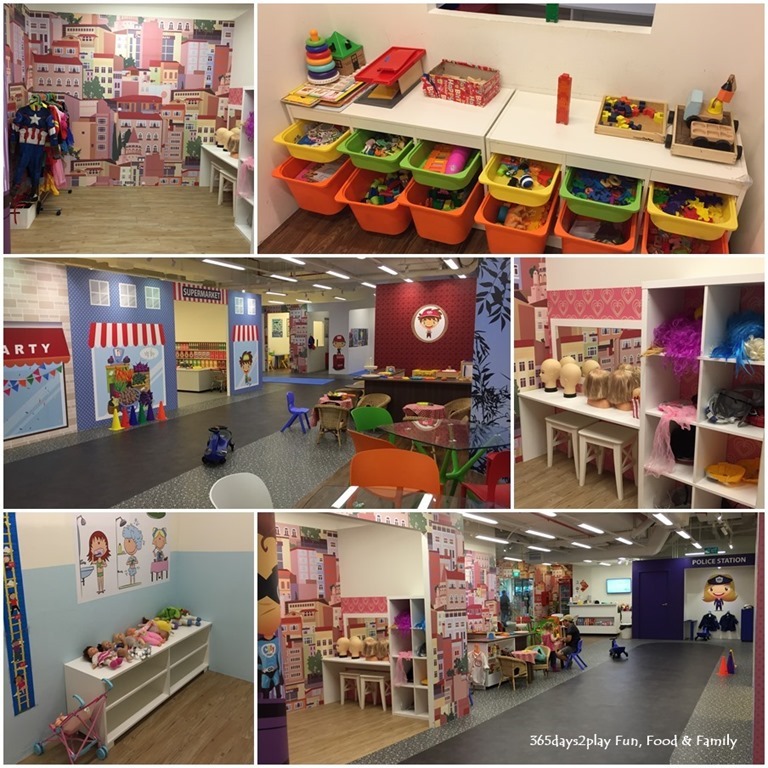 This is an indoor playground with pretend play as the main focus. The main highlights are the supermarket, the kitchen and cafe, some dress up area, and a room with large foam blocks for open-ended play. When I first visited, the place was pretty promising. 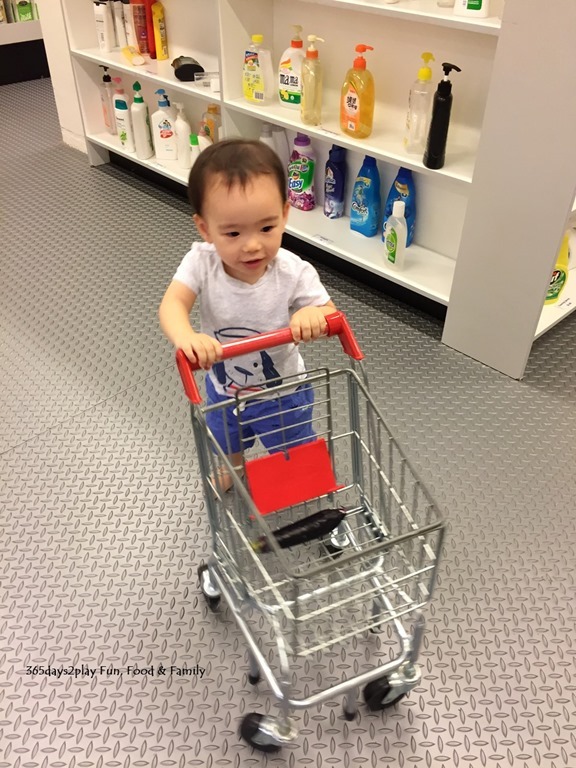 Edward enjoyed himself tremendously at the supermarket area. 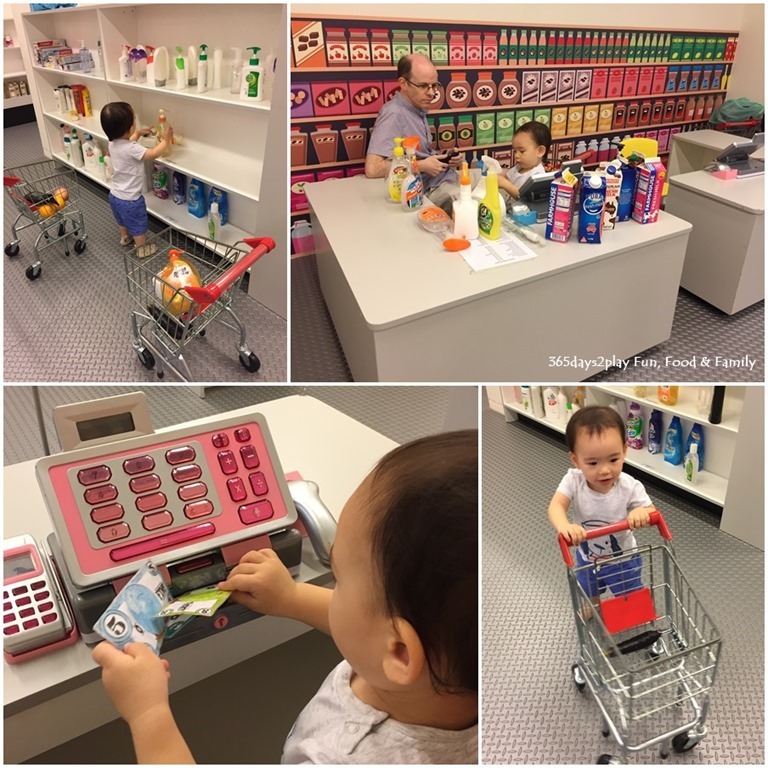 There were many shelves of fake supermarket goods, and little kid-sized supermarket trolleys. 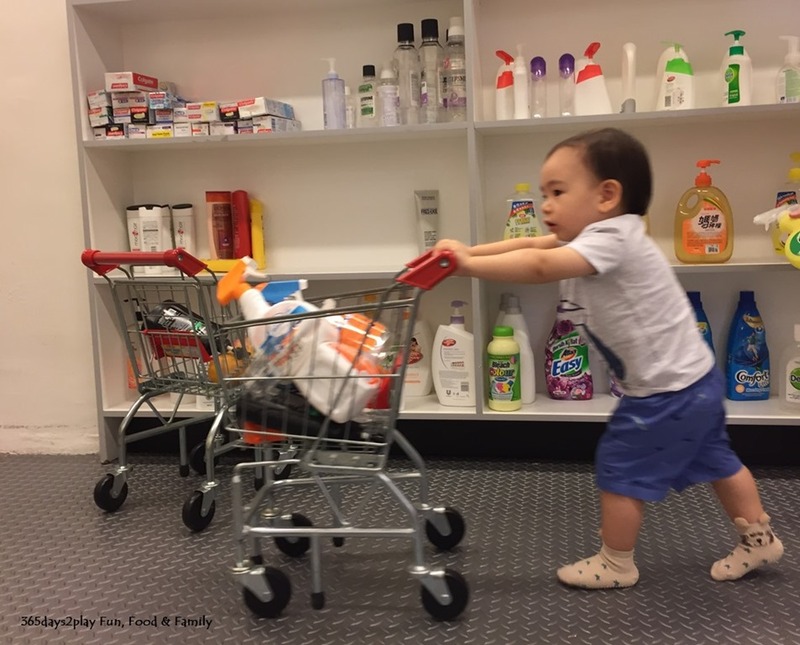 He went bonkers over the trolleys, filling them up with all the goods, and then going to the checkout counters to scan them over and over again. The fake money in the cash registers were great too. Edward also spend considerable time at the kitchen and cafe station. Half a year ago he was absolutely mad over taps and water, so he was all over the kitchen sink when we were there. 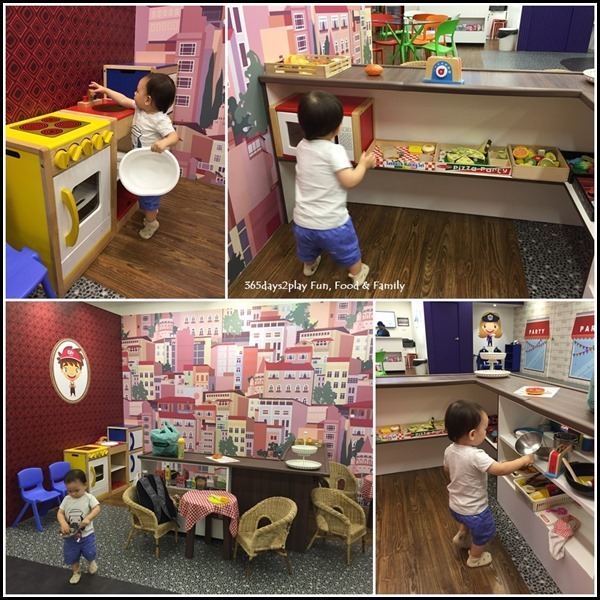 And of course, lots of pretend play with the wooden food pieces and kitchen equipment. 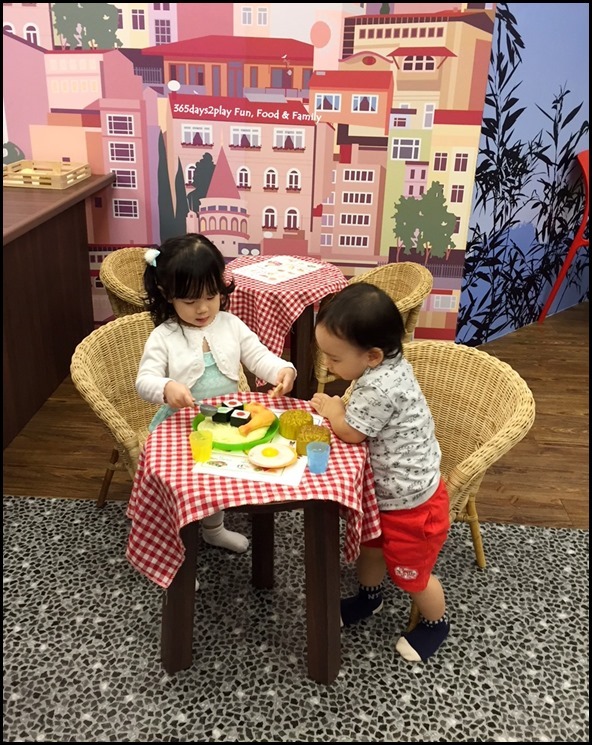 There is even a small sitting area for little friends to pretend to be cafe customers. The chairs are too small for adults though, yes I tried. All in all, we spent nearly 2 hours at The City, and I thought it was a pretty good use of the $18 for our weekday visit. I did think though that The City looked a little run-down. The supermarket items were looking a little worn out, lots of frayed cardboard boxes etc. 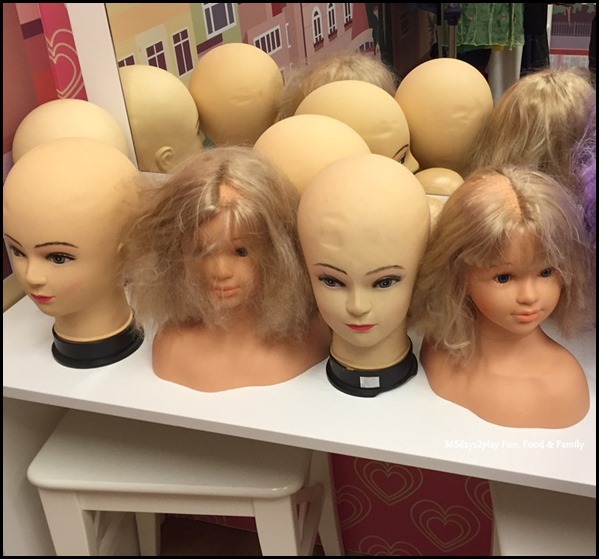 I steered Edward clear of the dress up area with the clothes as the clothes smelled musty and god knows when they were last cleaned. No health check done aka sick children can also gain entry! Alas I returned again on National Day with friends, and was appalled at the condition of The City. My friends who had arrived earlier, noticed a boy with mucus dripping down his nose playing at The City. So they asked the reception if a health check (like temperature check at least) is done but the staff say they do not do health checks. The only thing they have is the hand sanitiser. The staff also claimed that the boy was crying, hence the mucus. Well that boy went about with the mucus hanging out of his nose for quite a while. I wonder why his mother didn’t bother to wipe it off, since she was actually following him around now and then! What a sight, and this was when I was paying for my entry ticket. I almost wanted to leave! Dirty, unkempt play areas. Diminishing toys…. So since we were there already, we headed straight for the supermarket section. 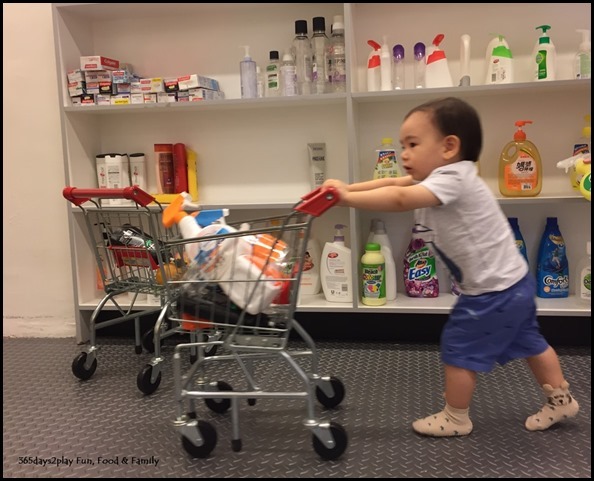 Edward lost no time in being a customer of the supermarket as well as the cashier at the same time. Meanwhile, I was in my dirt detective mode. The supermarket items were looking even more forlorn than the 1st time we visited. A lot of items on the shelves were looking dusty. A lot of the milk cartons also had frayed cardboard. The vegetable compartment with foam type vegetables had weird green and grey patches on them. They are not furry mould, and I don’t know what they are. Discolouration, or worse? Felt icky looking at them! Thankfully Edward steered clear of the veggies! Sadly, there were only a couple of pieces of the toy money in the cash register, even more bent and wrinkled compared to the last visit. Why haven’t they been replaced? After spending about 20 minutes at the supermarket section, we moved on to the kitchen and cafe section. This section didn’t look quite as dirty, probably because of the material used. But it seems that the selection of toy food has diminished. Probably some lost or broken and thrown away but never replaced. We spent about 10 minutes here. This time round, we spent about 20 minutes at the foam blocks section. Because Edward is very much into jumping and moving about like a monkey these days, he had great fun walking on the blocks as if they were bridges or jumping off the blocks and repeating that 100 times. His little friend Mae also had a good time here and the both of them were so cute playing together, or getting into each other’s way. After Edward got tired of this section, we decided to call it a day. Don’t think I will be revisiting The City anytime soon unless the place receives a good sprucing-up. Scroll down for some other photos of the place. It is lucky children aren’t so observant of the dirt or dilapidation. As they say, children will find a way to play, no matter where they are. 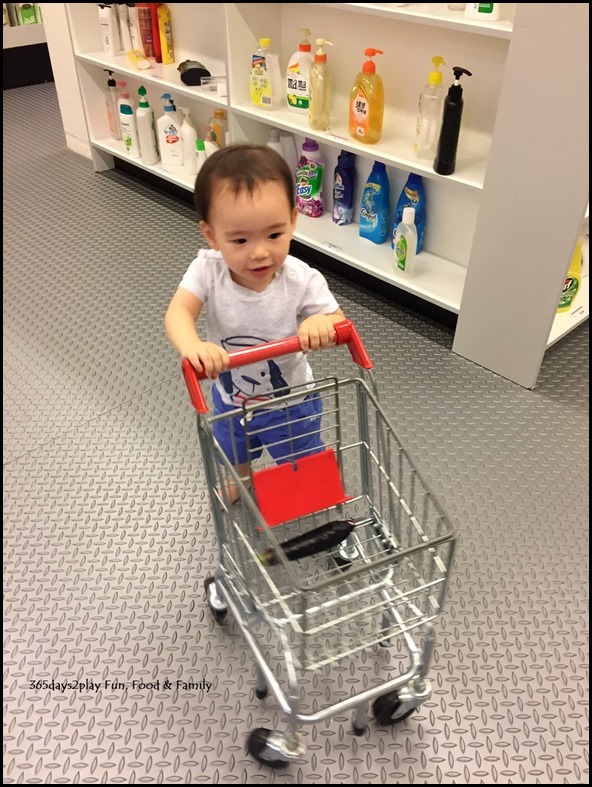 I must admit of all the indoor playgrounds I’ve been to, The City provides the most realistic supermarket trolleys. They are metal, almost the same as a real trolley for adults, but just miniature-sized! And those bottles of detergent, shampoos and what-nots, Edward loved it all! 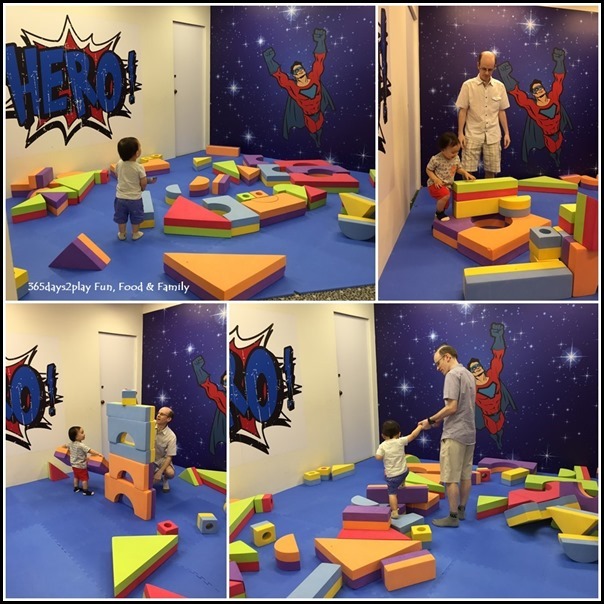 The various play areas at The City. This picture above was taken on our second visit. In terrible condition. 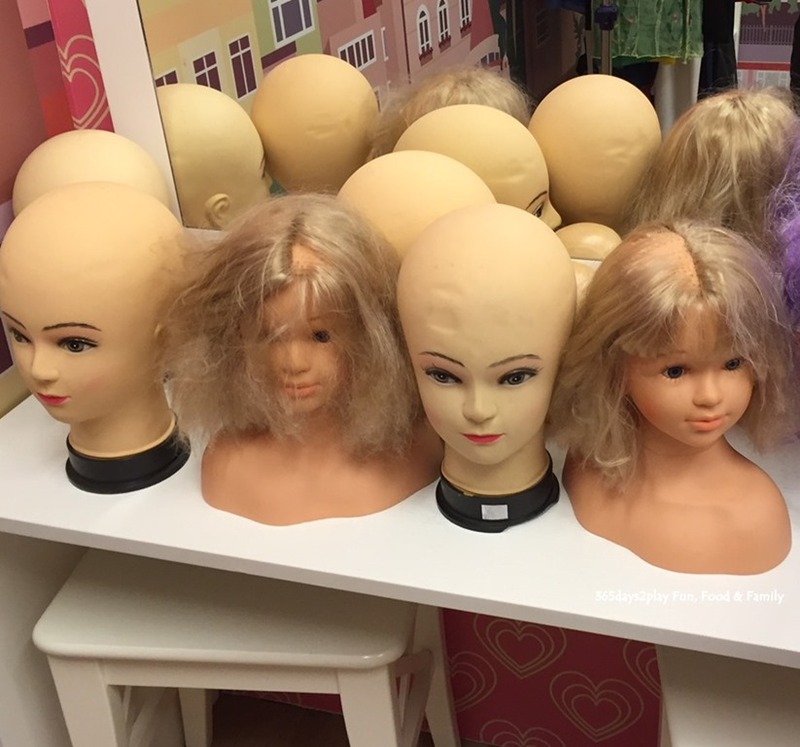 Parts of the scalp are bald! 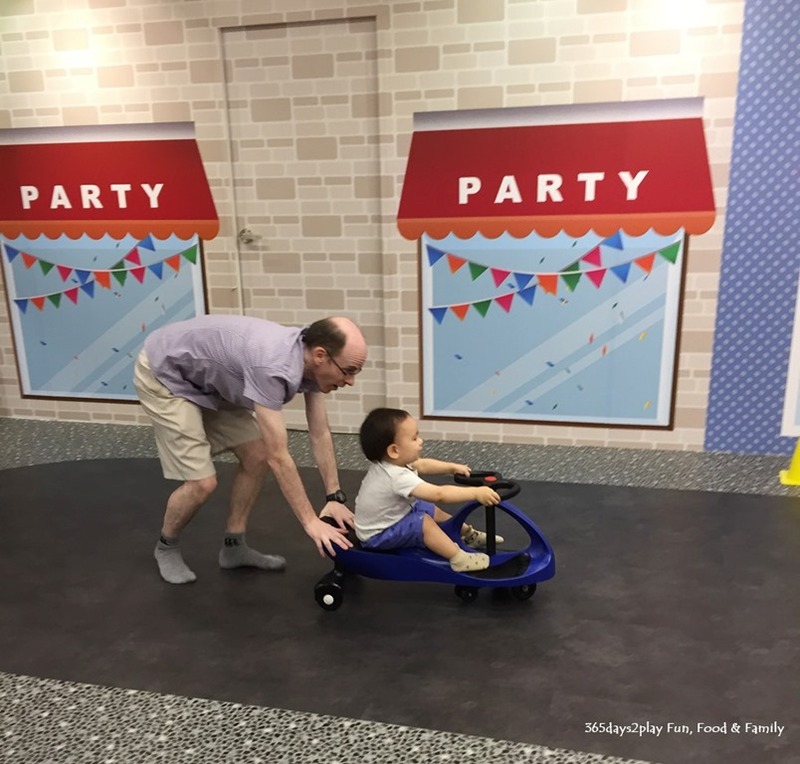 For a similar price, you can visit The Joy of Toys, which also has a lot of pretend play elements, including a small kitchen and supermarket. 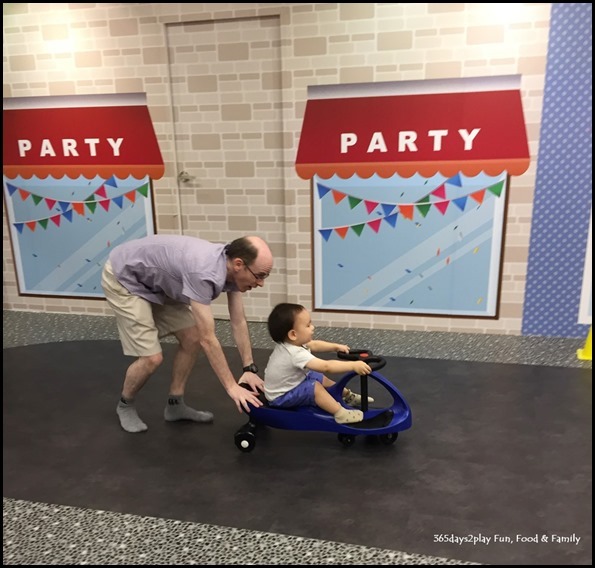 These are smaller than at The City, but there are also other things like a huge train set, and also a dedicated space for babies and toddlers. « The BOILER opens 2nd outlet at Esplanade– Roll up your sleeves and eat seafood with your hands here.